Steve W. and Steve J. got some money together and had some printed circuit boards made, then planned to sell the computer as a kit. This is also when they officially formed the "Apple Computer Company" - Jobs used to work in an apple orchard. 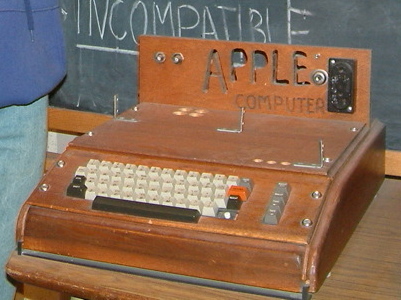 The Apple I was the result of the development efforts of Steve Wozniak, Steve Jobs, and Ron Wayne. It was developed, not in a garage, but in the bedroom of Steve Wozniak's home on 11161 Crist Drive in Los Altos (the house number was later changed to 2066). Steve Wozniak built the printed circuit-board, while Ron Wayne wrote the Apple-1 Operation Manual at his home. Steve Jobs did what he does best, advertising the Apple I to friends and family.